June 1st through November 30th is the official beginning of the 2012 Atlantic Hurricane Season. This season has no inclination to adhere to climatology as it began back in May 19 with Tropical Storm Alberto forming that Saturday afternoon off the South Carolina coast. Not since 1908 has there been a storm that early before the season officially began on June 1st .There after we dealt with Tropical Storm Beryl that marked the third time on record, that two tropical cyclones reached tropical storm strength during May before the beginning of Atlantic Hurricane Season. The Saffir-Simpson Scale shown below is a categorization of tropical cyclones based on their wind speeds, barometric pressures and storm surges in feet. This helps forecasters inform the public in a warned area of the level of the tropical weather threat. Keep in mind even a weak tropical system can unleash tremendous amounts of rain leading to loss of life or damage to property. If a Tropical Storm or Hurricane Watch is issued that means that inclement conditions are expected in the watch are within 48 hours. If a Tropical Storm or Hurricane Warning is issued that implies that preparations should rushed to completion as adverse weather conditions are anticipated within 24 hours or less. The National Oceanic and Atmospheric Association Forecast calls for 70 percent chance of nine to 15 named storms (with top winds of 39 mph or higher), of which four to eight will strengthen to a hurricane (with top winds of 74 mph or higher) and of those one to three will become major hurricanes (with top winds of 111 mph or higher, ranking Category 3, 4 or 5). Based on the period 1981-2010, an average season produces 12 named storms with six hurricanes, including three major hurricanes. As far as early Tropical Atlantic Cyclones go, Tropical Storm Beryl was the most intense preseason storm to impact the U.S. directly on record. Beryl began as a fledgling low pressure system near the coast of South East Florida, off of Miami on May 23,2012. At Miami Beach there were wind gusts reported to near gale force (39-54mph) as it moved Northeast. On May 26,2012 as the system continued to move Northeast along the S.E. United States coastline it was classified as Subtropical Storm Beryl. While Beryl continued to crawl off of the Carolina-Georgia-North Florida coast it began to enter a more hospitable environment conducive to further development with warmer sea surface temperatures and less wind shear aloft. Vertical wind shear has an inhibiting effect on tropical cyclones as it tends to dislocate the thunderstorms from the low level center blowing them off and not allowing the storm to organize or deepen further. 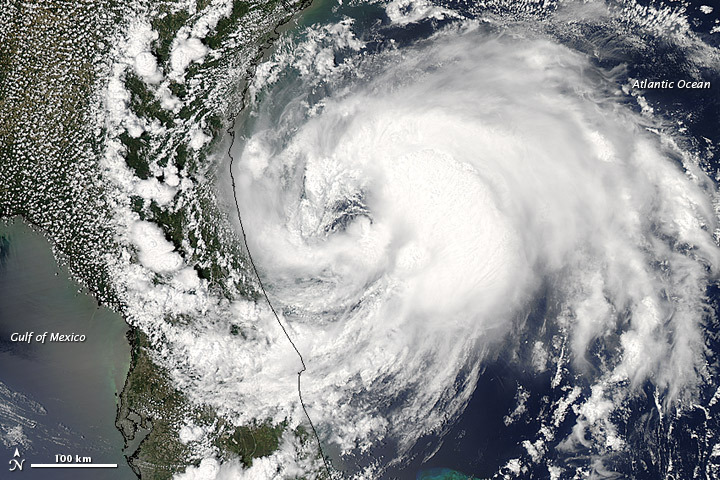 At 11pm EDT on May 27, 2012 Beryl transitioned from a subtropical system to a fully tropical system only 120 miles off of the North Florida Coast. On Sunday May 28 strong tropical storm Beryl came ashore near Jacksonville Beach, Florida with peak sustained winds at the time of landfall of 70mph. There was a peak wind gust recorded that evening at 73 mph in the northern part of Jacksonville Beach in Mayport. With both Alberto and Beryl forming close to the Southeast coastline of the United States it portends that many of the systems of the 2012 Atlantic Hurricane Season will form similarly. The areas to watch for a direct impact this year will be in the Caribbean to Florida into the Northern Gulf Coast. The next name on the 2012 Atlantic Hurricane List is Chris which weather models are hinting may come out of the disturbed weather in the Northwest Caribbean and the Gulf of Mexico over the next two weeks. Make sure to monitor the latest tropical weather forecasts or news and be prepared before the storm is at your door. Have a Hurricane Preparedness plan in place for you and your family. The up two week supply of essentials are Canned Foods, Bottled Water, Weather Radio, Batteries, First Aid Kit, Multivitamins, Sunscreen,Extra Cash from ATM’s, Bug Repellant, Flashlights, Other non-perishable food items, extra gas for generators or vehicles as gas stations will not work after a storm passes due to power outages. Posted on June 5, 2012, in Health, National Security, Science and tagged Beryl, Caribbean, Florida, Gulf of Mexico, Jacksonville Beach Florida, Lists of tropical cyclone names, National Hurricane Center, South Carolina, Tropical cyclone, Tropical Storm Alberto, Tropical Storm Beryl, United States. Bookmark the permalink. Leave a comment.